So it all started in the beginning of June. We had an open space of around 8m x 8m in our commercial aquaponics plant tunnel. We decided to put this space to good use and increase our plant production capacity by an additional 740 plants, keeping build costs as low as possible. Cajun Lopser kindly offered his volunteering services to build the system as he wanted to learn more about aquaponics. Cajun and Kondwani then teamed up and started building. We decided to go the DWC (Deep water culture) route. The frames of the DWC plant grow beds were built with pallet wood and treated with a sealant agent. They were then lined with preformed recycled 550g/420 micron polyester scrim reinforced PVC liners. Each DWC growbed measures 1m (width) x 6m (length) x 380mm (height). We used the same liner material for the 900 liter fish tank, with wire mesh reinforcement. For filtration we used our combo filter that is able to handle up to 30 000 litres per hour. The first compartment in the filter separates the solids and is fitted with brushes to trap floating matter. The second compartment in the filters acts as a biofilter and is filled with plastic bio balls. To keep power consumption as low as possible, we used one 100 watt LP-100 air pump only, used for both pumping water (air lift pump) and oxygenation for DWC growbeds. We're very happy with the performance of the air-lift pump and are managing to pump up to 1.3 meters high. The water flow process is very simple. The DWC grow beds also double up as a "sump". The water is pumped up from the DWC growbeds into the Fish-tank by means of the air-lift pump action. From the Fish-tank, the water is gravity fed through the Combo filter and then gravity fed back into the grow beds. We ensure that the water level on all 3 grow beds remain the same by interconnecting them with a 50mm pipe. All water pipes used in the system are 50mm. 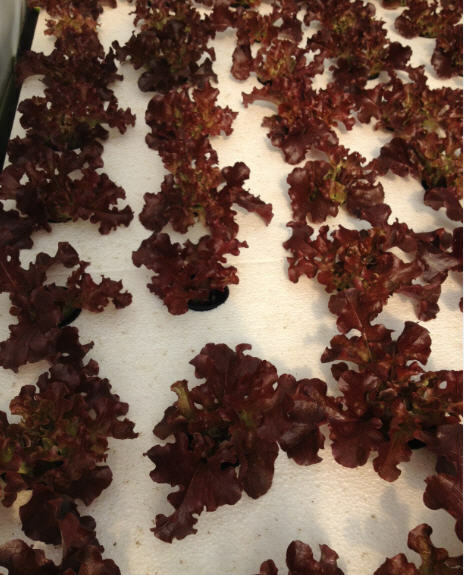 » HOW IS IT POSSIBLE TO GROW PLANTS IN WATER In AQUAPONICS?